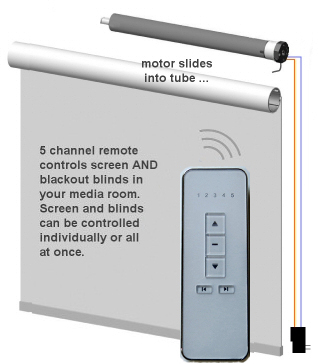 Motorized Roller Shades & LED Lighting - Control With Same Remote? FAQ: Can you remote control blind motors & lights? Our RollerNode™ radio equipped controller uses RF (Radio Frequency) to control 12v DC roller blind motors AND low voltage LED lighting. A hand held or wall mounted multi-channel remote transmits a remote control signal to a small antenna in the controller housing. The control signal is decoded and an Arduino® compatible microprocessor then activates the motor and/or LED lighting. The optional MiniMight motor controller board can also be re-purposed and used to control other devices (such as relays) simply by connecting relays to the motor outputs. You can also alter the behavior of your controller by reprogramming the Arduino microprocessor with a simple upload via USB from a laptop or similar device. This will be covered in the advanced instructions for reprogramming the Arduino microcontroller. This system is different from the infrared signal that you may be familiar with that is used on most television sets. Unlike infrared, the RF signal is not directional, so you do not have to point the remote at the roller shade or blind. The RF signal is also capable of passing through walls and in many cases can reach anywhere inside a typical home. Our multi-channel remotes have up to 14 channels that can be programmed to control blind motors in various different rooms and hallways throughout the house.